The book organizes the journeys geographically starting from the north in Scotland, moving gradually south. The book touches on interesting landscapes, art, architecture, and cultural aspects along the way. It seems obvious but the typical answer: ‘any kind of journey taken for a specific religious purpose, with an over night stay at a pilgrim centre’ has expanded over time. According to Canon Law, medieval pilgrimage was any mandatory journey undertaken as a form of penance for wrongdoing or, a voluntary act under oath. “A vow was recited, and the symbols of a pilgrim were taken on by the traveller, i.e., the Pilgrim’s staff and insignia denoting the purpose of their journey” (p.11). Pilgrimage was a booming business, and remains so today. It has witnessed a recent resurgence in popularity, with many people embarking on a soul searching journey for religious and personal reasons. In the Middle Ages, when pilgrimage was at its peak, authentic relics brought pilgrims flocking to a particular church or site and increased the coffers of the clergy. Churches, abbeys and Cathedrals, vied for the prestige, coins and attention of these holy travellers. In the Late Middle Ages, pilgrimages were considered indulgences. One could absolve themselves of sin by embarking on a pilgrimage as a form of ‘buying salvation’. As with any popular activity, there were bound to be unscrupulous con artists. Relic scams were rampant; when rival churches claimed to have the same sacred piece of a saint, it planted seeds of disbelief. Accusations increased in the later medieval period as pilgrimage grew more popular and stories of churches substituting animal bones and other kinds of fraud became common. The increase in relic fraud eventually led to disillusionment with the cult od relics and pilgrimage during the Renaissance and Reformation. Woodcut of a pilgrimage (c.1490). Pilgrimage now is a mix of tourism, self-discovery, and faith. People who dislike attending church seem to flock to pilgrimage sites and enjoy them from a cultural perspective. Wells also mentions that modern conservation and heritage groups help promote and connect the past to the present along these routes. St. Cuthbert’s Way in conjunction with the Scottish Tourist Board, worked together to recreate St. Cuthbert’s pilgrimage route and used the saint’s gold and garnet pectoral cross as markers along the way. What do we learn about the sites in this book? Of all the sites, listed in this book, St. Andrews’s Way in Scotland is the most authentic of the medieval pilgrimage routes. The 1,000 year old route was relaunched in 2012 with markers denoting the original path medieval pilgrims took. It is 115km (71 miles) long, a route from St. Andrews to Edinburgh spanning approximately four day’s journaey. St. Andrew’s was built upon a more ancient Christian site that dates back to the eighth century. Various stories indicate the relics of St. Andrew were brought to the site between the fourth and eighth century. The Cathedral was founded in 1162 and completed in 1318. Pilgrimage was so popular to St. Andrews during the Middle Ages that pilgrims were kept in holding areas before being processed to the relics, and even the town was laid out to accommodate pilgrim traffic. UK Lifestyle Photographer – Emma Wells (February, 2016). Photo courtesy of Emma J. Wells. Wells takes time to detail each of the seven routes for those interested in embarking on a pilgrimage. 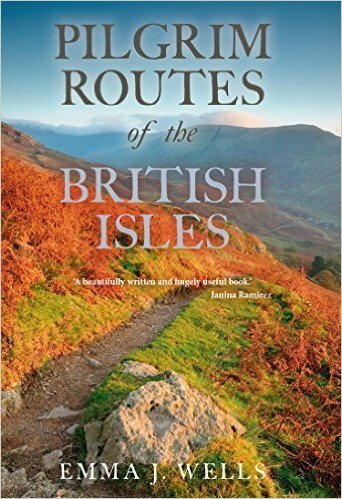 If you would like to go on a pilgrimage within Britain, this book is a must-have before you set one foot outside your door. Each route is described with useful tips, highlights, and pertinent historical background. Wells has also added some fantastic photos and maps for further reference of what to look for along the journey. Whether your goal is spiritual, or cultural, Pilgrim Routes of the British Isles will be a welcome addition to your journey.